Bigger isn’t always better, and that is definitely the case when it comes to small Smart TVs. In fact, these days the smaller models actually come with just as many benefits as larger TVs have, if not more, with the space saving capability sitting atop the list of reasons to consider a small TV over a larger one. And now, with the smart tv market growing by the day, it seems logical to not only opt for a small TV that won’t take up much space in your home, but to also select one that comes with a range of functionalities that allow you to do away with the need for cables and wires everywhere. As with any TV, there are a few things that you should consider when it comes to selecting the right smart TV for your home or office. 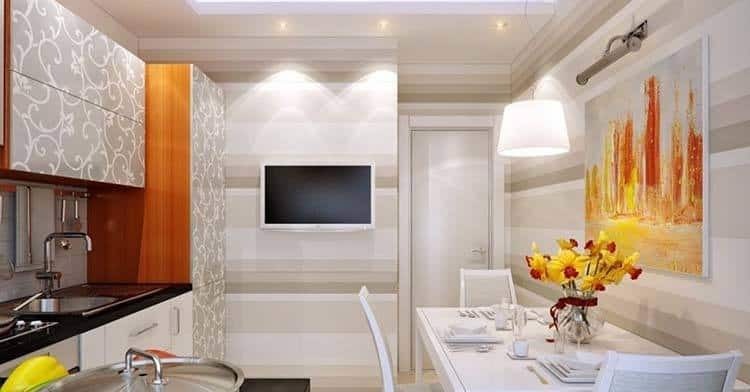 The Size – You need to consider both the size of the area that your TV will be located in and the size of the TV set itself. Even small smart TVs vary in size and shape, so you’ll need to keep this in mind when it comes to shopping for your next set. 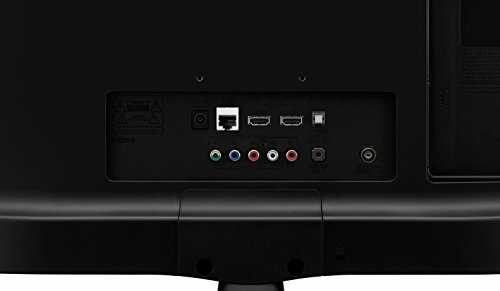 The Positioning – These days most small TVs come with a detachable stand, allowing you to choose between mounting it on a wall or standing it on something. Not every model will come with this option though, so it’s worth considering where you’d like the TV to go before purchasing a TV that you want to be freestanding but that does not come with a stand. The Resolution – The more pixels, the sharper the display. It’s as simple as that. While few small TVs are going to be able to boast of the same high resolution of a considerably larger TV, it’s still important to bear in mind that the resolutions will differ from model to model. That being said, if you’re buying a small TV then it might not be worth investing in a 4K resolution because it won’t be as noticeable on such a small screen. The Features – While most smart TVs now come with apps that allow you to stream easily from Netflix and Amazon Prime, it’s worth checking exactly what apps you will be able to use before deciding on a TV. And, if there is a certain app you’d like to make use of, don’t just assume that it will be available as the apps vary from model to model. Your Budget – Small TVs are cheaper than bigger ones, it’s a simple fact but even so the prices of the smaller sets can still vary quite drastically from one another. Don’t be put off considering an older TV as these days they generally have quite long shelf lives. In order to select the model that I felt was deserving of the title of best small smart TV, I tried three different sets out. I took into consideration the basic specifications of each set before going on to test out the sound quality, address the picture quality and try out the technology available. I did find some similarities across the three TVs, but they are all from a similar price bracket, so this was to be expected. Alongside the similarities, however, I found a few differences between the models and they made it easy for me to select my top small smart TV at the end of the day. The LG Electronics Smart LED TV is a 24-inch set. As a smart TV, it can be connected to your Wifi, which then provides easy access to Netflix, Youtube, Hulu and many other streaming services. In addition, this TV comes with two HDMI ports for the times when you want to connect your laptop or other devices to the set. The TV is compact and versatile, with the option to have it mounted on the wall or fitted to a stand. It measures at 21.9” x 5.8” x 15.2” and weighs 7.5lbs with the stand attached, without the stand the set measures at 21.9” x 2.1” x 13.6” and weighs 7.1lbs. The TV comes with an HD Display (1366 x 768p). That, combined with the LED backlighting that is set into a wide angled viewing screen, means that this small smart TV has quite an impressive picture quality to it. As you would expect with any small TV, the speakers on this set aren’t anything to rave about. While I found them to be perfectly adequate in the rooms I was using them in, you wouldn’t want to use this set as your main TV or to rely on its ability to project sound across a large room. However, that should be expected due to the size of the TV and this could be easily overcome by purchasing external speakers or a soundbar. You would expect any smart TV to enable you to make use of a range of streaming services but I found that the LG set went above and beyond. With the ability to connect to your wifi service, as well as built-in Miracast and WiDi connectivity, and the HDMI ports, the applications that can be accessed through this TV set seem to be endless. The TCL Smart LED TV is a little larger than the LG, with a 28-inch screen but it’s still another great contender if you’re looking for a small smart TV for an office, kitchen or spare bedroom. With dimensions that measure up at 25.3” x 15.1” x 3.2” without the stand attached and at 25.3” x 17.1” x 7.3” with the stand. This TV, therefore, is a little bit wider than the LG TV but still weighs in at just 7.5lbs so it’s quite a lightweight model that can stand-alone or be mounted on the wall. 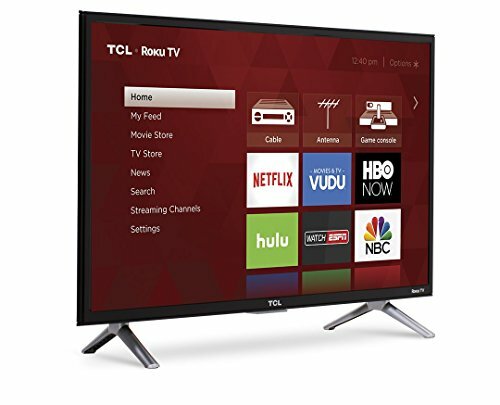 With 3 HDMI inputs, 1 USB port, a headphone jack and an optical audio out, this TCL is a versatile piece of equipment that will provide you with plenty of ways to use it. The screen is a little bit wider than the previous TV I looked at, and I found that with the direct-lit LED, widescreen and 720p HD resolution combined, the picture was of a relatively good quality. In addition, the 60Hz refresh rate meant that even fast moving scenes could be watched without signs of blurring, as is often the case with lower-priced, small TVs. Yet again, the sound quality on this TV will not blow you away. If you’re looking for something with a surround-sound system, this is not the TV for you but the sound quality could definitely be improved by purchasing a soundbar or some kind of similar speaker system. The smart technology in this little TV functions through Roku TV, an app which gives access to over 4,000 streaming channels. This huge number then gives you the option to watch over 450,000 movies and TV episodes. The only problem with the Roku function is that it is often quite buggy, which could potentially be due to the large number of services it is trying to provide, but I cannot say for certain if that is the reason. Either way, while the technology is smart, it sometimes seems a bit too smart for this small set. 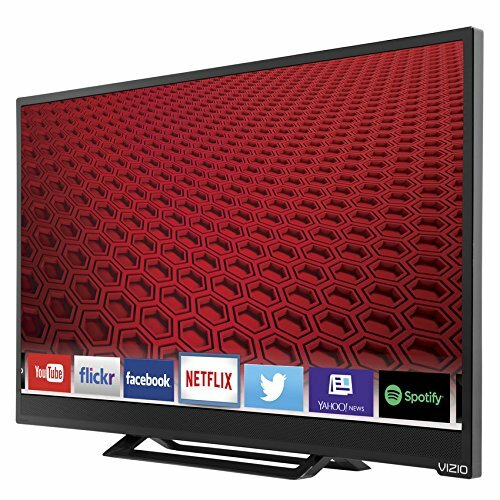 The Vizio E24-C1 was the second 24-inch TV that I looked at. Measuring at 4.39” x 21.55” x 13.8”, it is the slimmest of the three TVs mentioned here and is just a fraction smaller in measurements than the LG Electronics Set. 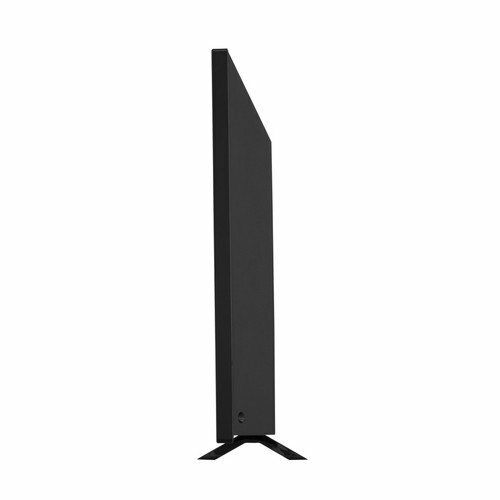 Its slimline appearance makes this quite an attractive looking TV, and yet it still weighs roughly the same amount as the other two smart TVs. 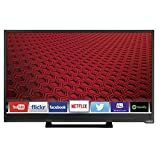 As a 2015 model, this is also the oldest of the three TVs but, as is the case with many smart TVs today, this is not really a big problem as smart TVs tend to have quite a long shelf life. The screen on this TV is matte, which does stop unwanted glare from occurring but that does also mean that the picture quality isn’t quite as sharp. The TV does, however, have a 1080p Full HD screen so the picture quality is by no means disappointing. In fact, it has a higher resolution than the other two models that I looked at, it simply isn’t as sharp due to the matte screen—but that’s a sacrifice many would gladly make to limit annoying glare if placing it in a very bright room. 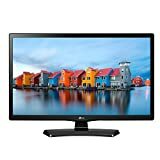 As with any 24” TV, the sound quality is not anything to boast about but as mentioned before, this is an issue that could be very easily taken care of. One of my favorite features of this TV was its automatic update function. By removing the need to manually update the apps, I was able to rest easy knowing that the TV was always up-to-date with the latest software. 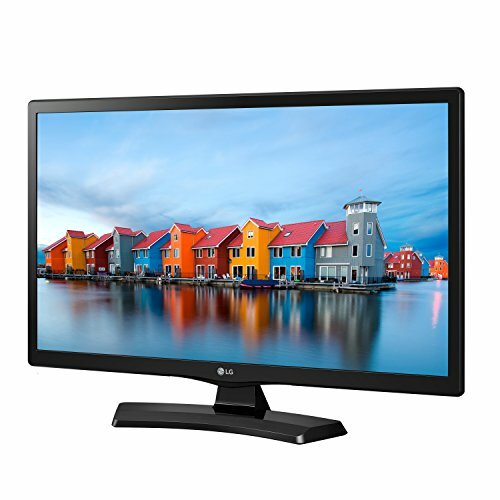 A small TV is a great addition to any office, spare room or bedroom. They are lightweight and don’t require much space, for starters. And the smart TVs now also mean that you can watch TV in a small space without worrying about cable connections or endless wires making a mess of the room. Each of the small smart TVs that I looked at had their own set of pros and cons but all-in-all I would say that the LG Electronics is the best model addressed today. With a simple interface, it beat the other two models that were, admittedly, smart but almost seemed to have too much technology built into them which left them lagging at times. The sound quality was not fantastic on any of the TVs so that did not come into my considerations. The picture quality, however, was fairly impressive on the LG considering that its screen is quite small and that the resolution is only 720p.